Dr. Steve Alexander's photographs have appeared in publications such as International Wildlife, National Geographic, National Geographic Books, Skin Diver Magazine, Natural History, Geo, Airone, and many others. He has also authored many scientific publications in journals such as Nature, Cell Biology, Foraminiferal Research, and Marine Biology. 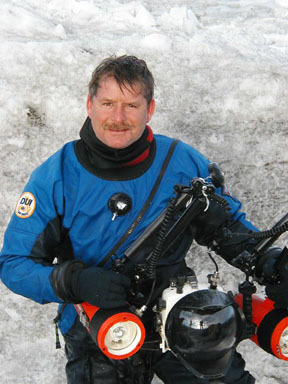 He began diving at the age of 13 in England where 10 foot visibility is a luxury and frigid water the norm. One year later he bought a Minolta in a plexiglass housing and began to experiment with underwater photography. Many years later, after completeing a B.Sc. Hons. in Oceanography and Zoology, and a Ph.D in Oceanography at the University of Wales Swansea , Steve accepted a post-doctoral position at Scripps Institution of Oceanography in San Diego, CA with Dr. Ted DeLaca. The project was to study giant foraminifera (protozoa) in Antarctica, and it was there that Steve's passion for photography came alive and a life-long pursuit of new images and adventures began. After a period as a cell-biology researcher in Albany, New York working with Dr Sam Bowser, he married his beautiful wife Jennifer, moved back to San Diego, and spent seven years seeking a way to travel and photograph the world's oceans unconstrained by research grants and time schedules. Realizing the potential of sail power for unlimited travel, the dream was born, and they bought Sojourner, in 1997 and began outfitting her for a round-the-world voyage. In 1999 they cast of the lines in San Diego and headed to the South Pacific on their "World Oceans Voyage". After almost 3 years of exploring the South Pacific islands and reefs, Steve and Jen are currently in Antarctica while Sojourner is in storage in Fiji for the hurricane (cyclone) season. Steve and Jen will return to Sojourner in February of 2002 to begin exploring Fiji's spectacular reefs.